DPD (Dynamic Parcel Distribution) make it simple for UK customers to track their packages, from the moment they leave the sender to when they arrive at their destination. To track a parcel with DPD, you’ll need your parcel number. This will be included in the confirmation email that the company sends when every parcel is dispatched, while you can also contact the sender to request your parcel number. If for some reason you miss a delivery, the number will also be included on the “we’re sorry we missed you card” that DPD will slip through your letterbox. You can also use the DPD tracking service to make any changes to your order that are necessary. For example, you can specify that your package should be left with a neighbour or dropped off at your workplace, instead of your home. You can also ask DPD so send your package to one of 2,500+ pick-up stops, which include many high street shops. DPD also provides a handy mobile app to help customers keep track of their parcels. YourDPD is available for Android and Apple devices. It links up to mapping services, showing exactly where your parcel is and your current position in the delivery queue. It provides an accurate estimated time of arrival and can also be configured to send an alert 30 minutes before your driver arrives, so you can plan to be in to meet the driver and accept your parcel. 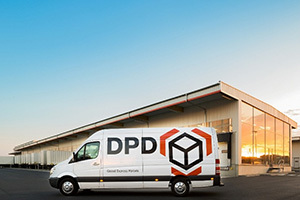 DPD was founded in 1977 in Germany, and has become a major European delivery provider, sending 2 million parcels every day. Nowadays, it isn’t just a German operation. In fact, the company’s majority owner is a branch of the French Post Office, La Poste. Since 2001, it has also had a major UK component, following the purchase of Parceline, one of the country’s largest private parcel distributors. The firm operates two main divisions, DPC Classic and DPD International. Classic is the major branch that everyday customers will use, as it deals with packages up to 31.5kg in size, while International handles bulk commercial orders. Whichever service you choose, you can take advantage of DPD’s recent drive towards technological innovation, with the company now offering real-time map-based tracking and one of the most advanced tracking apps available. My parcel to be delivered to ziffit.com was collected on 5 /10, it has not arrived at ziffit.com yet, due to a previous parcel going missing I took the precaution of filming the driver collecting it, it’s now been 1 week and it’s still not delivered, on Monday I will be taking legal advice, I suffer heart and lung disease and cancer so do not have the luxury of a long wait, in future I will use some other methods of sending my goods. We hope you’ll get well. As for the shipment, you might need to use Express services, as they are made for such cases. You attempted to deliver my goods on 13th Sept and you promise to deliver it again on the 14th Sep. But up til now nothing has not been delivered. The sender said DPD said incorrect address. How can my address be incorrect on the 14th Sep & 15th September, when my address was correct on the 13th Sept. When l tried to track it with the number on the card. The number is not correct. The clothes is for my daughter’s wedding. I need it asap. Not happy with DPD service at all. I’m still waiting for my parcel to be delivered, I should according to the text I received have been delivered on the 25/4, I have received 8 messages to say the parcel will be delivered . You left a parcel that wasn’t mine and you picked it up but I’m still waiting for MiINE. Can you sort this out please ASAP . I’m not a happy bunny, your service is awful. What a bad experience.☹️☹️☹️Will never use this service ever. What a waste of my time. Orders 2 garage shelving units and only reduced 1 but that were despatched from seller at same time whats going on. Not impressed lately, I paid for next day delivery granted it was Friday evening so expected delivery Monday or Tuesday at the latest. It had not even left the drop off point by late Tuesday evening. The parcel finally arrived Thursday afternoon! Not the service you expect from dpd! My phone was collected for delivery to music magpie on Tuesday, it is now saturday and it has still not arrived…..
1.08. Not happy with the service they do. ???? it would realy help me out of bigot an era prety pls I will chuck a drink to driver Jamie bell thanks ?